Search engine hero google plays as a king in the web and maintain its top position in all services except social networking. After the failure of buzz, google struggling to maintain its place in social networking. Buzz failed due to massive privacy concerns and lack of interest. Google Buzz was released as an opt-out feature, meaning one day millions of people woke up to their e-mail contact lists splashed all over the Web. Google panicked and apologized for the error in judgment. It takes a lot of nerve for Google to attempt another social networking site. ReadWriteWeb also reported that "90 percent of the content published into Buzz is automated: 63 percent is piped in from Twitter and 27 percent is from automated RSS feeds." That's not social networking; that's social regurgitation. Social media has been one of Google's most elusive goals. The company just hasn't produced anything that has moved the needle on social media: Orkut is probably having a good month with the Brazilians in the World Cup quarterfinals, but it doesn't resonate anywhere else. So far, Google’s failed to have a hit in the social-networking space, swinging and largely missing with both Orkut and Buzz. But Google has attempted to hit reset on its social strategy in 2010, and Google Me could be the first project designed entirely by that new group. If Google Me does come to pass, expect Google to do its homework on the privacy front (finally) and pitch the service as the anti-Facebook, with clear privacy controls and easily exported data. Assuming Google learned its lesson from Buzz, Google Me should be an entirely opt-in Web site with crystal-clear privacy controls and brand new features that aren't just trickle-down from other Web sites. But rock-solid privacy controls are key: as much as we love Facebook, we don't need another months-long Facebook privacy fiasco, and Google -- no stranger to privacy violations itself -- should know that. Unless google officially stated about google me, its conformed former CTO of facebook and founder of Digg. Rumors that Google is working on a Facebook competitor called "Google Me" were confirmed by Facebook's former CTO, Adam D'Angelo, in a website. * This is not a rumor. This is a real project. There are a large number of people working on it. I am completely confident about this. * They realized that Buzz wasn't enough and that they need to build out a full, first-class social network. They are modeling it off of Facebook. * They had assumed that Facebook's growth would slow as it grew, and that Facebook wouldn't be able to have too much leverage over them, but then it just didn't stop, and now they are really scared. 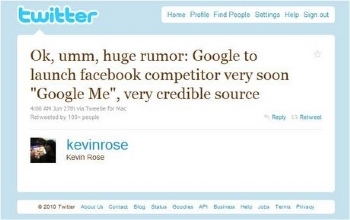 According to a tweet from Digg founder Kevin Rose, Google is preparing to launch a rival social networking service called "Google Me." What is Google planning? And how would a new "Facebook competitor" tie in with Google's existing social networking services, Orkut and Google Buzz? If Google truly is getting into a war with Facebook, and there's no reason to believe that it isn't, then the combination of both Orkut and Buzz would be the obvious choice. Knowing that a Google account is required to use Orkut, and a Gmail account is required for Buzz, we can safely assume that we're looking at roughly 200 million users to any service that would combine the two. This number could sway one direction or the other, as a Google account does not equate to a Gmail account, but I'd say that 200 million is a solid guess. @SQL Training: You are right, friend. We expect official announcement on Google Me at very soon.